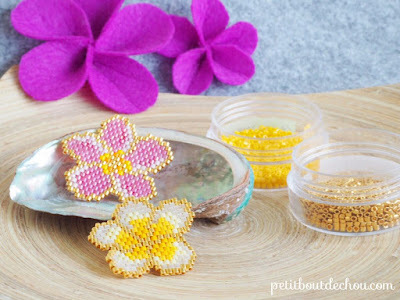 Estelle, a French beader based in Hong Kong, shared this Miyuki tutorial on her blog, Petit Bout de Chou. These beaded frangipani (pulmeria) flowers can be uses as pendants and earrings if you add the necessary loops. However, if you adapt the pattern and make these larger, they could become pretty awesome coasters! The Miyuki Delica beads are so even for this purpose. This tutorial reminded me of my childhood, growing up in South East Asia. We didn't have many toys back then. But I remember my young friends and I tying up bunches of frangipani flowers with rubber bands and used them as "balls", keeping it aloft by kicking them with our feet! The flowers have a rich, cloying scent especially at night which the plant uses to lure moth pollinators. 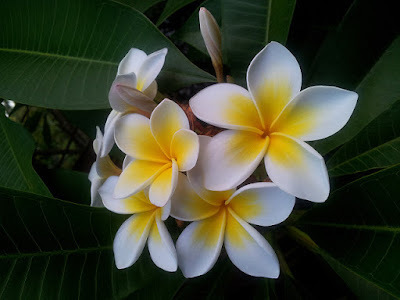 The frangipani is indigenous to Central and South America and Polynesia but have naturalized all over the world including South and South East Asia. The Polynesians use them in leis. Other Asian cultures use them in temples. In local folk beliefs they provide shelter to ghosts and demons. In Malay folklore, the scent is associated with the pontianak, a female vampire ghost. Had we known that as children, I don't think my friends and I would have been climbing the trees for the flowers!! These are so pretty. I have a lovely frangipani tree in my garden, and right now it is in full bloom. But I feel sad when the season gets over. Your post as well as the link to Estelle`s blog has thrilled me. It is just what I was looking for.Going to make a few for myself. Thank you for sharing. Lucky you! Frangipani trees do not grow here in Canada!